The gift giving season is upon us! I actually love putting lots of thought into my gifts & trying to be creative. My list is long, with some being far easier to shop for than others, but regardless, I always enjoy the shopping. Babies are especially fun to shop for though. Who doesn't love seeing everything in itty bitty sizes. With Kane being my third baby, he really doesn't need much (or anything! ), but of course I still want to spoil the boy a bit! And Santa surely has to bring something; otherwise, the older boys would be suspicious! 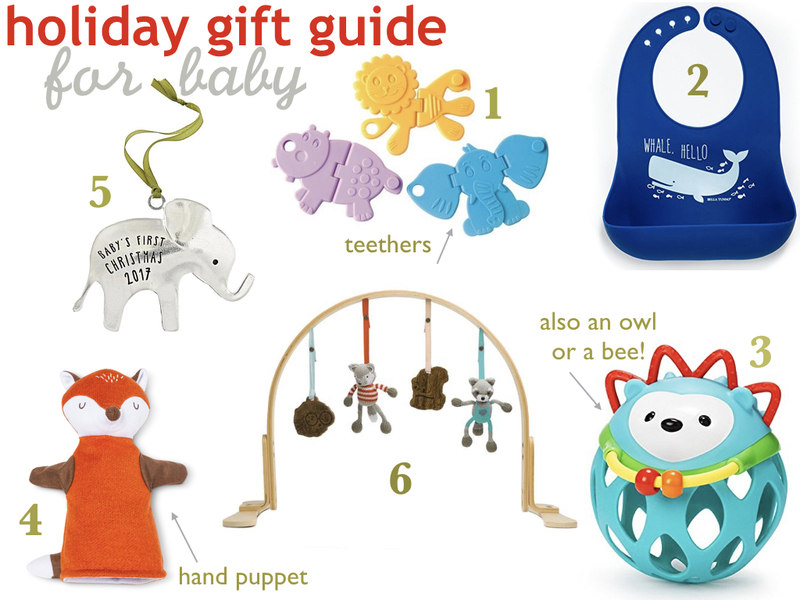 All of these ideas are mostly stocking stuffers except for the play gym. We've never had one before, but this adorable woodland themed play gym may just make it into our home! And of course, I won't be able to resist all the small shops during black friday. If enough of them post their sales before the actual day, I will try my hardest to get a small shop guide up. I love being able to support families directly as well as American made goods. So tell me... what are you buying the babes in your life this Christmas? I was totally going to ask if you wouldn't mind sharing some of the small shops that you love to support! Yes! I will try to get something together this week before the craziness of all my in-laws arriving! Perfect ideas! My mom was asking what we'd like for our second and I said well he can't do much but I have no idea! Now I have some things!